In the U.S., Pears typically peak during late August through September in the South, and September and October in the North. In order to produce good local pears, producers depend on ideal spring and early summer weather conditions, and no late frosts. Now, here's the surprise: pears are picked unripe and left to ripe in a cool, dry, dark place (like a basement or garage). If you wait for them to ripen on the tree, you probably won't harvest many - they'll rot and be attacked by bugs and birds. Most growers furnish picking containers designed for pears, but they may charge you for them; be sure to call before you go to see if you need to bring containers. If you use your own containers, Pears are fairly durable. Plastic dishpans, metal oven pans with 3 inch tall sides and large pots make good containers. 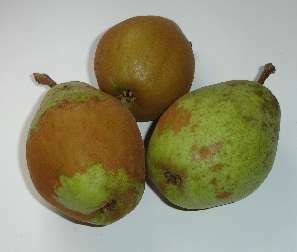 Asian Pears, which do not need a storage period before they are ready to use. How to tell if the pears are ripe! The fruit can be ripened on the tree, but for better quality, they are best picked early and allowed to ripen indoors. Most pears ripen from the inside out, and if left on the tree to ripen, many varieties will become brown at the core and rotten the middle. This is especially common in most fall pears. Pears have a characteristically gritty texture caused by cells in the meat called stone cells. Although modern varieties have fewer of these stone cells, all varieties still contain them. Picking the pears before they have matured and holding them under cool controlled conditions prevents the formation of too many stone cells, and results in a less gritty pear! 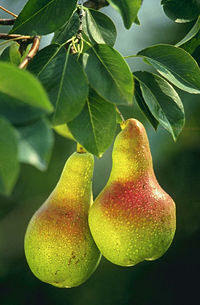 Attached to the tree: Pears are best picked when the fruit separates easily from the twigs. If it is hard to pull off the tree, it isn't ready! Texture: A pear ready to be picked should have a feeling of springiness to its flesh. Close your hand around one and squeeze. If it feels absolutely rock hard, it's still not ready. You should be able to detect a slight feeling of give, but not too much. Color: there is a change in fruit color from green to yellow; and the stem separates easily from the branch. To pick pears, grasp the fruit firmly and twist or roll it to make the stem separate from the tree. Asian pears, unlike European pears, should be allowed to ripen on the tree. They need no after-ripening storage period. Asian pears are ready for harvest when they come away easily from the spur or branch when they are lifted and twisted slightly. Also when green skin color starts to change to yellow, they're ripe. .Use the taste test; they're ready when they taste good. Asian pears should be crisp and crunchy when eaten. Marks on the Pears: Bugs (particularly squash bugs and stink bugs) bite fruit during development and this results in some imperfections in the pear. This is especially the case with organically raised fruit. These look like dents in the pears if the pears were bitten by a bug when they were young. This causes a spot that does not grow properly and makes a wrinkle in the pear. There's nothing wrong with these pears. They may look funny, but they will taste just as good as blemish-free pears, and it's better not to have the pesticides! About 2 medium pears = 1 cup sliced pears. About 4 medium pears = 1 cup pureed pear. Carbohydrates make up 98% of the energy provided by a pear. Pears provide a natural quick source of energy, due largely to high amounts of two monosaccharides: fructose and glucose. contraction, nerve transmission, and carbohydrate and protein metabolism. One medium pear provides 11% of the RDA for ascorbic acid (vitamin C). Most supermarkets don't sell really ripe pears because they bruise so easily, but it's very easy to ripen them at home. If pears are picked before they are fully ripe, they should be ripened at a temperature of 60 F to 70 F. This will result in optimum quality and smoothness of flesh. If you want to keep pears for a longer period of time, store the freshly picked fruit in the refrigerator. They'll keep for many weeks! Fall pears can be kept on a shelf at room temperature until ready to eat when yellow color develops and the fruit begins to soften. Fall pears can be stored but usually do not keep for more than 4 to 6 weeks, Many people use their fall pears for canning and drying. Asian pears can be stored but may develop a strong, wine-like taste if kept too long. If you store Asian pears loosely in a box, clip the stems short, because the stiff stems can puncture and damage neighboring fruit. And allow enough space that the pears do not touch each other; pears that rub each other will often become dark at the rub points. Winter pears should be put into some kind of cold storage (below 40 F, down to 33 F) for at least 3 weeks. After that period, you can start to bring out fruit as needed to soften up at room temperature. At first it may take 5 to 9 days before the pears are ready to eat; later on a couple of days at room temperature may be long enough. Did you know you can make pear-sauce - just like applesauce, except you remove the pits before cooking them. You can still use a foley food mill and sieve, or you can peel them first! If you like apple butter and you like pears, you'll LOVE this easy pear butter recipe, complete with canning instructions, so you can make them now and give them away at Christmas time! In most recipes, frozen or canned pears can be substituted for fresh pears. The frozen and canned pears have already been sweetened; therefore, the amount of sugar called for in a recipe will have to be adjusted. Also, the pears should usually be drained before using.